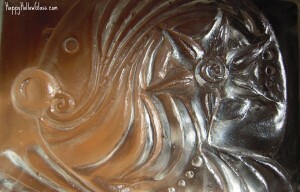 Cast Tile using molten glass in a hand carved plaster mold. 6 x 9 x 1.5 – Gifted and displayed in the Bradley Collection. …but there area a few things you may not have heard. [hr]DID YOU KNOW? One tiny shard of the specially formulated HOT glass – borosilicate can destroy the viscosity of an entire furnace of recycling soft glass cullet (the regular stuff). I’m finding that people are unaware of the fact that borosilicate glass, aka. Pyrex® and tempered glass, CANNOT be recycled along with common jars and bottles. ….the majority of sites fail to mention this fact to customers. This could happen for a few reasons but I have several theories. 1) They may be worried about “scaring” customers by stating NOT recyclable! – If customers are NOT informed of this “NOT RECYCLABLE” fact – literally tons and TONS of perfectly good soft glass could be ruined for good… and its only fate at that point is waste or fill. NOPE! – Not even your precious glass pans and measuring cups can be put in that ‘ole blue bin! FYI… Coffee cups, plates and all stone ware or ceramics are out too! (That’s not glass at all) 2) They all claim “LIFE TIME guarantee” and therefore completely omit information on having to discard the straws if they should break… They would then be forced to tell you that their straws – just like mine – are in fact… NOT recyclable! Yet another reason why the Zero Waste philosophy is so important! The guarantee is great and all but there’s a simple explanation for it! THIS IS STRONG BOROSILICATE GLASS and unlikely to break with normal use. It is NOT INDESTRUCTIBLE. Let’s be honest folks – It is in the nature of GLASS to break and occasionally some undetected stress can cause a crack or fracture. If that should happen well… NOW you know – Do NOT RECYCLE borosilicate! Visit the HOW page for inspiration, ideas and tips on re-use and up-cycling multiple mediums! That said – YES! I too – stand behind every Zero Waste Straw created! 3) Lastly – Is it possible they don’t know for themselves?!…. hrrrmm…. Either Way – the result of this lacking information is truly tragic and a complete contrast to the purpose of these creations. Happy Hollow Glass is committed to providing high quality Zero Waste Straws with a taste of the truth. A very cool green glass water bottle Up-cycled into a sweet drinking glass – ahh… saved from the recycle bin! That’s handy! The most commonly used glass is soda lime. This is the every day stuff that SHOULD be recycled. Although it’s best if you can find a way to re-use it! **Fellow artists … I’m always happy to share tips if you’re new to glass as a medium!